You are at:Home»Healthy Recipe»The Perfect Smoked Salmon Recipes for a Healthy Diet! Salmon fishcakes are a great option for throwing a party. You can always prepare these fishcakes ahead of time so that you do not need to rush at the time of your festive occasion. The flavor of smoked salmon combined with capers, potatoes and spring onions gives these fishcakes an amazing taste. Salmon is extremely healthy for your diet and so this smoked salmon fishcake recipe is a must try for you. 1. Boil the potatoes in a pot with water and then drain and set aside. Mash the potatoes with the spring onions properly. 2. Separate the eggs and mix the egg yolks to the potato mash and mix in the mayonnaise as well. 3. Now add in the smoked salmon, capers, chopped parsley and the tabasco sauce. Mix well. 5. Divide the mixture in to 8 portions and press them in to a pastry cutter and then brush the fishcakes with egg whites and then coat them in to the breadcrumbs. 6. ​Melt butter in a pan and then fry the fishcakes on both the sides. 7. To serve, mix the mayonnaise with the crushed garlic, lemon juice and the chopped parsley. 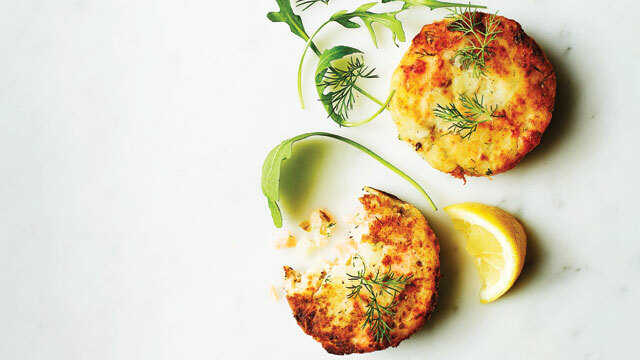 You can even freeze these fishcakes, thaw them a while before frying them in a pan. The perfect combination of smoked salmon and scrambled eggs for a hearty brunch or a late breakfast. 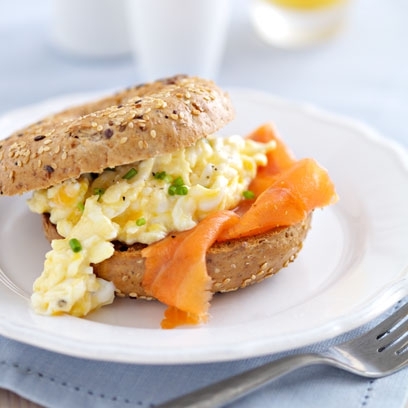 Try this toasted bagel which is served with mascarpone cheese, scrambled eggs and a slice of the smoky salmon. This breakfast dish is perfect for those who love the flavor of smoked salmon. 1. Toast the bagels until they turn to a nice golden color. 2. Beat the eggs and pour in to a non stick frying pan. 3. Now add in the mascarpone cheese and the salt and pepper. 4. Mix in the chives. 5. Gently stir until the egg is set. 6. Now very gently, put the scrambled eggs on the toasted bagel. 7. Now place the slice of smoked salmon. 8. Sprinkle more black pepper and serve! Instead of mascarpone cheese, you can also choose cream cheese, crème fraiche or the usual cream. A smoky salmon recipe on a classic taramasalata makes the perfect and light lunch served with warm or toasted pita bread and salad. This dish can even be served as a quick appetizer provided you receive unexpected guests. This dish can be made in a quick span of time and kids love it as well. 1.Take a food blender and add in the smoked salmon, cream cheese and the Greek yogurt. Add in the lemon zest. 2.Mix in the creamed horseradish and the black pepper. 3.Blend the ingredients until all of them are mixed and smooth. 4.Put the mixture in to a serving bowl. 5.Drizzle over the olive oil. 6.Spoon the salmon caviar on top before serving. 7.Serve with warm or toasted pita bread (and salad if you like) and enjoy! Do not over blend the mixture or else it will be too soft and paste like and unable to eat. You can substitute the Greek yogurt with the low fat yogurt if you wish your dish to be healthier. Reserve the salmon caviar for kids as it is extremely healthy. A perfect combination for a hearty breakfast with scrambled eggs, avocado and smoked salmon. The perfect meal you would want to have in order to stay fit and avoid unwanted carbs. This is an open faced sandwich that can even be served as a snack. You can prepare this sandwich ahead of time and wrap them in a cling film and just serve when unexpected guests arrive. This way you would not have to be in a complete rush. 1.Mix 2 tablespoons of chives, crème fraiche and eggs. 2.Melt butter in a skillet. Add the egg mixture. Season with salt and pepper and cook until completely set. 3.Toast your bread. Place toasted bread slices on a plate. 4.Mash the avocado with a fork on a plate. Season with lemon juice, salt and pepper. 5.Spread the mashed avocado on the toast. 6.Now place the cooked scrambled eggs on the toast. 7.Next, put the smoked salmon slices on top. Garnish with the remaining chives. 8.Season with black pepper and serve! Use fresh bread for the perfect taste. You can even make a fried egg instead of the scrambled ones and put on the toast. To save up time, you can prepare these sandwiches ahead of time and wrap them up in plastic cover and serve immediately. A quick and easy smoked salmon omelette that is stacked up with proteins is a perfectly fresh start for your day. Make sure that the cheese has been melted properly or else it will not give the same cheesy taste that this recipe has. Your breakfast will be more tempting with fresh orange juice along with it or a steaming hot cup of tea. 1.Separate the egg yolks and the egg whites. 2. Mix the egg yolks with water. 3. Beat the egg whites until they turn foamy. 4. Fold the egg whites into the egg yolks. 5. Heat butter in to a frying pan and then fry the eggs. 6. Sprinkle the cheese on top of the egg and let it melt. 7. Next, place the slice of smoked salmon on top. 8. Fold over the omelette so as to enclose the cheese and the smoked salmon. 9. Sprinkle chopped chives over the omelette and serve! If you are in a hurry and wish to speed up the cooking time, cover the frying pan with a lid so it will make the cheese melt and the smoky flavor of the salmon will incorporate the whole dish properly. You can increase the amount of the cheese if you wish for your omelette to be extra cheesy. salty but very good. cooked the fish in a smoker turned out very nice. Thanks for Sharing .